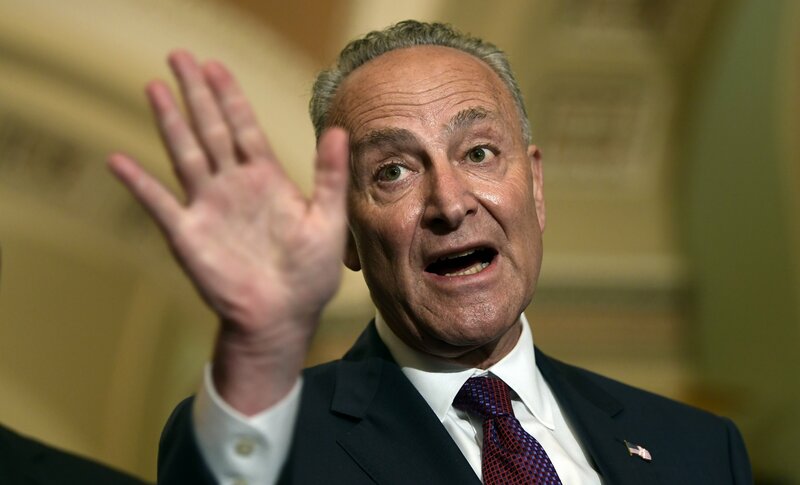 WASHINGTON — Chuck Schumer, the Senate Democratic leader, says it’s all about health care. Sen. Richard Blumenthal, D-Conn., worries about the impact on the special counsel investigation. And Sen. Kamala Harris, D-Calif., sees an assault that could set women’s rights back decades. There’s so much for Democrats to dislike about Brett Kavanaugh, President Donald Trump’s Supreme Court pick. And that may be the problem. In the hours after the Republican president tapped the conservative jurist, Democrats struggled to unify behind a clear and coherent message to combat the nomination, which could shift the court to the right for decades. They’re energized, outraged and ready to fight. But what, exactly, is their argument to voters? MoveOn’s Washington director Ben Wikler, who was among hundreds of liberal activists protesting outside the Supreme Court, acknowledged Democrats were far from unified behind a simple message to rally voters against Trump’s selection. “The essential message is Roe,” Wikler said, citing the potential that a more conservative court would overturn the landmark Roe v. Wade decision that legalized abortion nationwide. It’s an all-too-familiar political challenge for Democrats, who’ve left voters confused in the Trump era about what the party stands for beyond simply opposing the president. And in this case, the muddled messaging threatens to dampen a new surge of voter enthusiasm just a few months before midterm elections. For decades, Supreme Court battles have motivated the GOP’s socially conservative base far more than Democrats. But in an era where liberal protests have become nearly weekly events, Democratic strategists and activists say they see a new sense of urgency when it comes to the country’s highest court. In part, that’s because Kavanaugh’s confirmation would give the court a decisive conservative majority for a generation. Democrats hope to model their opposition on their successful effort fending off a repeal of the Affordable Care Act last year, despite a Republican majority in Congress. But that fight featured a simple, clear argument — save the ACA — and the clear risk that millions of Americans could lose their health care. The political impact of the court debate is messier. The new surge of energy could help Democrats in House races, where the party’s fortunes largely rest in suburban swing districts. But the Democratic fight for congressional control could take a hit in the Senate, where party incumbents are fighting for their political futures in deep-red states where control of the court could be an important factor for voters. The large number of Democrats eyeing presidential runs in 2020 further complicates the dynamic as they harness the energy and rhetoric of the left in ways that might not help red-state Democrats this year. The question heading into the midterms, say strategists, comes down to who is more motivated —the conservatives eager to support Kavanaugh or the liberals who are fiercely opposed. Already, both sides have poured money into the battle. The conservative Judicial Crisis Network plans to launch a $1.4 million ad buy in four states — Alabama, Indiana, North Dakota and West Virginia — introducing the nominee in a favorable light. The conservative Koch network has committed at least another $1 million. Meanwhile, the liberal advocacy group Demand Justice will spend $5 million on ads through September aimed at pressuring key senators. Women’s rights groups raised the alarm across several key states that access to abortion was at stake. NARAL Pro-Choice America launched a new advertising campaign warning that Kavanagh is “ready to end Roe v. Wade.” The organization, which supports abortion rights, is also planning a national day of protests for the end of next month. But Kavanaugh’s record complicates the Democrats’ initial desire to focus solely on abortion rights. While Trump repeatedly promised during the campaign to select a nominee who would overturn Roe v. Wade, Kavanaugh has sometimes taken a more cautious approach. The abortion issue is of particular importance this year, when women have emerged as the driving force in the Democratic Party. Women lead most of the major Democratic resistance groups, coordinated the major anti-Trump protests and are running for office in record numbers at all levels of government. For Republicans, Kavanaugh represents the culmination of a decadeslong effort to tilt the balance of the country’s highest court. “This is the moment that the pro-life movement has been looking forward to for decades,” said Marjorie Dannenfelser, president of the anti-abortion group Susan B. Anthony List. Both sides are acutely aware of those gender dynamics. Kavanaugh peppered his acceptance speech with references to his daughters, wife and mother and noted that “a majority” of his law clerks were women. Two hours later, the Democratic National Committee blasted out a press release noting that men authored all the statements of support for Kavanaugh released by the White House. That kind of back and forth won’t matter much come Election Day, some leading Democrats predict. EDITOR’S NOTE — Lisa Lerer has covered national politics for The Associated Press for four years. Steve Peoples has covered national politics for the AP for seven years.